According to Forbes, a significant element of Detroit’s out of control municipal costs involve abandoned buildings—police chasing criminals and drug dealers hiding in abandoned buildings, the fire department responding to 7,200 fires a year in blighted or empty buildings, decreasing property values due to widespread blight. Should Detroit fix up its thousands of abandoned, typically foreclosed residential homes in the hope that the market will rebound or simply tear them down, adding to the city’s huge acreage of vacant plots? Last week, Michigan Governor Rick Snyder dedicated $52.3 million, more than half of $100 million of unused TARP (Troubled Asset Relief Program) funds, for a massive new demolition effort. The challenge is massive. 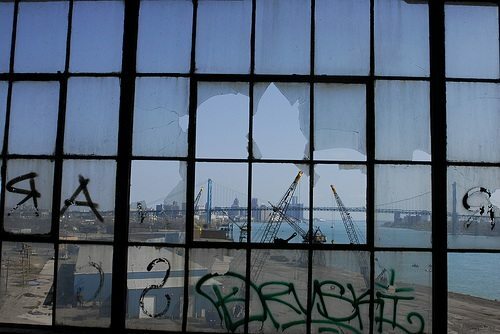 Forbes reports that there are an astounding 78,000 abandoned buildings still standing in the Motor City. If every nickel of the $52 million were devoted to demolition, with no program administration costs and no expenditures for neighborhood stabilization in the surrounding areas, the $10,000 per home average demolition cost means that the allocation wouldn’t deal for too many more than 5,200 properties. In 2010, Detroit launched a program to demolish 10,000 homes over three years with a $72 million commitment, but so far has only knocked down half of that number and says it needs another $40 million to tear down the remaining units. Given the limitations, what should the demolition strategy be? Bill Pulte, the 25-year-old grandson of the founder of Pulte Homes, has created a nonprofit called the Detroit Blight Authority dedicated to combat blight in Detroit. Pulte believes that the city’s demolition approach hasn’t worked, that “knocking down nuisance drug houses one by one isn’t enough to stop deterioration.” He believes that mass demolition in targeted neighborhoods is a better strategy, taking advantage of economies of scale that would reduce the per-structure cost of demolitions by half. Pulte’s nonprofit has raised, according to Forbes, $750,000 from private foundations including $100,000 from the Pulte family (there are at least two foundations clearly affiliated with the Pulte family, the Genesis Foundation located in Bloomfield Hills, a suburb of Detroit, and the Pulte Family Foundation, based in Boca Raton, Florida). The parent company, the $4.8 billion Pulte Homes, is also a grantmaker. However, Pulte’s nonprofit is looking to receive and deploy as much as $40 million of the Detroit-targeted $52 million in TARP funds. Economy Remix: Can We Ditch Tax Incentives and Support True Economic Development? Economic development incentives cost states and localities up to $90 billion a year, often starving education and social services for resources in the process. Gradually, albeit far too slowly, the field is coming to recognize the folly of developing the local economy by throwing tax dollars at corporations.